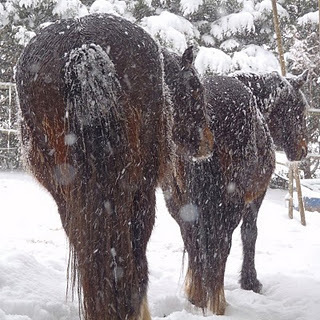 I have no idea what my ponies enjoy about standing around outside when the snow starts flying. Even though they have access to shelters, their thick double coats seem to provide enough protection that they often prefer to brave the elements than stay sensibly inside. That’s Bonny to the right and Brio closer to the camera. Note that Brio has inherited her mother’s glorious broad rump. Frances, on the other hand, has it all figured out. 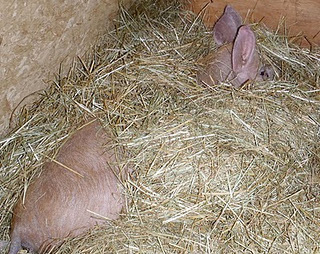 She burrows into her deep pile of hay, makes a nest, and snoozes until either a) more food arrives or b) the weather improves. 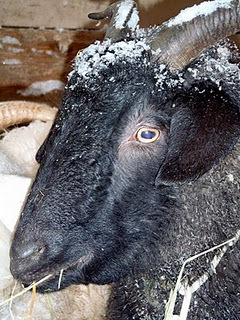 Nosmo and King (the Kashmir goats) have such a thick layer of soft insulation that the snow takes forever to melt even after they come inside the barn. Mind you, the goats are far less likely to venture outside in inclement weather. This afternoon, they saw me coming with the hay and decided to trot out into the blizzard to meet me at the gate. 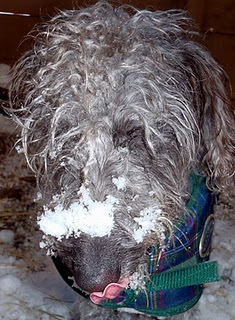 Pippi is just confused by the snow. She thinks it should be fun to eat, play with, roll in, dive into – and then she’s shocked when she winds up chilled to the bone. This, however, leads to a very entertaining reunion with the couch after she gets back to the house. She digs furiously at the blanket, fluffs up the pillows, dives under the pillows, spins around in place six times, wipes her face on the blanket and then repeats the whole process a couple of times before flaking out with a huge sigh.